We’re proud to announce the release of Low Lumens : Dawn/Dusk album from Burnt Toast Vinyl. The album will be available on cd and digitally from Burnt Toast Vinyl on 30 October and on cassette from Crime & Punishment Packaged Goods. Low Lumens is the moniker for the Pittsburgh based artist and musician Danny Bracken. His creative practice explores interactions between video, sound, and physical space, ranging from immersive, multi-sensory installations to small-scale sculptures. Born into a family of musicians, sound occupies a central role in his work; taking the form of film scores, installations, and stand-alone recordings. At the heart of these investigations lies an interest in the relationship between humans, the natural world, and technology. Explorations of how we embrace technological advancements while staying connected to ourselves, others, and the natural environment, are recurrent themes throughout his work. Bracken’s music further extends this dialogue, examining the tenuous balance between digital possibility and human impression, creating in a context that is constantly shifting between analog and digital realms. The release of Dawn/Dusk is a combination of two four song EPs that Bracken wrote and recorded between 2013-14. The all-instrumental Dawn/Dusk has moving electronic melodies interwoven with synthetic percussive sounds, rhythms, and patterns. For Dawn/Dusk, Bracken is interested in the balance between sounds considered beautiful and abrasive and questioning how far to push to that edge where the listener is no longer interested. Composed almost exclusively with digital tools, Dawn/Dusk reflects the artist’s curiosity about how technology can be used for expression while still retaining a human quality. The music of Dawn/Dusk is more directly musically influenced by mid 2000s Morr Music label releases, múm, early The Books records, Efterklang, Björk, Jon Hopkins, and Four Tet with a slight melodic nod to Bracken’s musically formative experiences in the band Anathallo. While working on these songs, Danny considered the idea of music that might not make a year’s-end best of list, records not considered being favorite or “important” records, but are actually the albums that we all end up playing the most. While not maybe directly referenced musically by Low Lumens, for Bracken some of these records have been Parables by Ryan Francesconi, Karl Burke’s Electronic Lament, Hauschka’s The Prepared Piano, and Laghdú by Caoimhín Ó Raghallaigh and Dan Trueman. These are the songs that become the subtle score to our days, music played in the morning when we wake up and in the evening to help us relax. Dawn and Dusk are a reference to those daily repetitions. Bracken wanted to make music that would fit into these patterns and could exist as a score for doing the dishes, while making love, or on the bus to work. His Low Lumens melodies are engaging with many memorable repetitive hooks. As a member of the Chicago based music collective Anathallo, Bracken recorded and toured extensively throughout North America, Europe, and Japan. Following the group’s hiatus in 2009, he recorded and performed alongside former bandmate Erica Walker as the duo Doubles. In 2010, he was invited to be musician-in-residence at the acclaimed Pittsburgh installation art museum the Mattress Factory. This innovative project brought together a group of musicians from several different countries and a broad range of musical genres and interests to collaborate over a period of 16 days. The residency culminated in a live performance and, in July 2012, the full-length album A Generous Act was released. Danny has composed music for film and television, most notably contributing to the documentary Blood Brother, a 2013 Sundance Festival award winner. In conjunction with a 2014 exhibition at the Mattress Factory for the Pittsburgh Biennial, Bracken made an edition of 50 seven-inch lathe cut clear vinyl records. Featuring music composed in and for a gallery space, the records extend the exhibition’s investigation on the limits of technological mediums, our relentless affection for the physical world, and our idealization of the past and future. The records were hand cut in real time and packaged with digitally printed inserts inside of silk-screened sleeves. 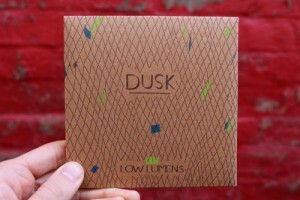 The limited edition packaging for Dawn/Dusk is conceptually an extension of those lathe cut records. Using a letterpress in combination with silkscreening, Bracken’s sketches and design were printed by hand through a collaboration with printmaker Will Stichter of HYMY Industries in Philadelphia. Purposefully utilizing what might be considered antiquated printing methods in combination with outdated media formats, Bracken continues his exploration of the physical in an increasingly digital world. Danny Bracken is currently an artist-in-residence as part of the Tough Art Residency at the Children’s Museum in Pittsburgh and keeps a busy exhibition schedule as a visual artist while continuing to write material as Low Lumens. 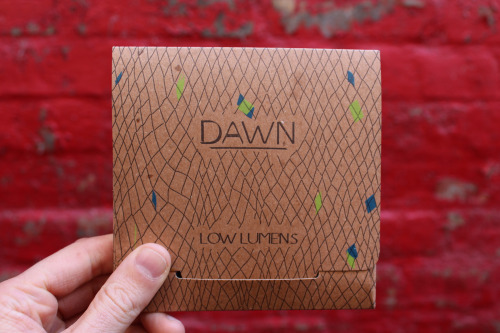 You can stream Dawn and Dusk separately from the Low Lumens bandcamp page embedded below. We’ll be releasing Oldermost’s It’s Difficult To Know Anything At All on cdep. It will be in stores on 19 May and is ready for pre-order for mail order now. You can check out the video for “A Drink (Or Two)” and stream the album below. We’re also involved in both the Crime & Punishment Brewing Co. and the launching cassette label Crime & Punishment Packaged Goods which will be releasing It’s Difficult To Know Anything At All on cassette.